Winter brings snow, sleet, ice and temperature extremes. While you may burrow inside for protection, your deck is left outside to brave the elements which wreak havoc on its bare wood planks. However, with a bit of forethought, planning and help, you can ensure that beautiful gathering spot will be awaiting you with the spring thaw. Work these deck care tips into your fall routine winterize and protect a deck. Removing all mobile items from the deck floor helps prevent markings from becoming permanent. Water, snow and ice remove more easily when you don’t have to stop to work around a large pot, patio furniture or grill base. Water trapped beneath deck items leads to discoloration, mildew and decay. Store items such as grills, potted plants, furniture and other items in a garage or shed in preparation for winter. Make sure to keep your deck free of dirt and debris. Autumn leaves, pine needles and other clutter traps moisture which encourages mold, mildew, discoloration and rot. Furthermore, this debris and grime become slippery when wet. Routinely sweeping these fall staples off your deck protects its surface and your guests. Some years bring drifting snow even as the leaves fall. For the protection of your deck, removing the snow in the fall and the coming winter months proves valuable. In the spring, your efforts will be rewarded with less damage and fading. When removing snow and ice, a snow blower is preferred. However, a shovel works in its absence, if used with care. Just be certain to move the shovel along the planks rather than across them to avoid scraping or chipping the wood. A thorough inspection of the decking, rails and supports allows you to address issues before they become costly. Winter winds and wet weather make these problems worse and may lead to significant repair in the spring. In the busyness of fall, be reminded that an ounce of prevention is worth a pound of cure. While summer activities and celebrations bring life to your deck, they also leave behind damaging dirt, barbecue remnants and the effects of sun exposure. Mildew, mold, moss and algae love these left behind conditions. A thorough cleaning washes away such issues. However, special treatment may be required for areas of mildew resistant to a simple washing. A bleach-free cleaner formulated for wood washes away summer’s remnants without touching the memories. Gray weathering and mold and mildew stains are removed with this treatment. For newer decks, a good power washing works as well. Now your deck is prepared for its next protective step. The moisture of the winter season loves the unprotected finish of a clean deck. The ability for rain, snow, sleet and ice to penetrate decking boards leads to cracking, splitting and warping, plus moisture open the door to rot, mold and mildew in the spring. Nail stability can be compromised, which causes the decking to shift. Stop the winter party of these issues by having a reputable professional apply a protective finish or stain to your cleaned deck. Either clear, semi transparent or solid, these formulas protect your deck. Some also come with technology which reflects solar rays adding a cool deck bonus next spring and summer. Years of enjoyment reveal decks that no longer repel water. As described above, the beauty of a winter wonderland quietly damages the boards which lay beneath. A professional job offers water repellent sealing to stave off these effects. 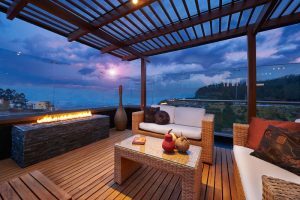 This investment proves wise for the future life of your deck. Sealing products and protective finishes can be applied in spot treatments for decks where only certain areas have lost their water repelling ability. To determine your deck’s need for sealing, spray the surface lightly with water. Boards that soak up the water require resealing. If the water beads in some areas, these spots do not necessarily need sealing. However, some professionals would recommend protecting your deck yearly for best results. If you are uncertain as to the level of your deck’s current protection, a professional can help make this determination. Time taken in the fall to protect and winterize your deck pays off. Whether used for relaxation or activity, quiet personal enjoyment or the gathering of friends and family, these simple steps ensure a spring without mold, mildew and other damage. Yes, the melting of the snow reveals a deck ready for whatever you have in mind.